This was the question on the minds of our SheStarts founders as they arrived at ANZ HQ in Melbourne for the final Immersion Days of the SheStarts accelerator before they fly out to the US this week. The monthly SheStarts Immersion Days are an opportunity for themed and focused learning during the SheStarts accelerator, where our founders spend time face-to-face with experts, partners and mentors to help accelerate their startup progress. As the SheStarts 2 cohort prepared for their flights to the US today (where they will be spending a week each in New York and San Francisco gleaning insights from two of the world’s most dynamic startup ecosystems), the Going Global theme gave the founders the chance to broaden their global vision and get in zone for their big trip – ready to meet some of the world’s most influential tech, startup, and investment leaders. Take time to stop and reflect. Carina Parisella from ANZ emphasised the importance of regularly recording your experience and reflecting on learnings, as there’s so much to take in. While travelling with the SheStarts team, Carina published two LinkedIn blogs around what she Learned in SF and also summarised the gold nuggets of advice she received while there. Sally Coldham, CEO of Airloom, said after visiting the US everything felt more accessible and achievable. Taking lessons from some of the biggest tech companies, the US trip helped Coldham to see just how much she could achieve. 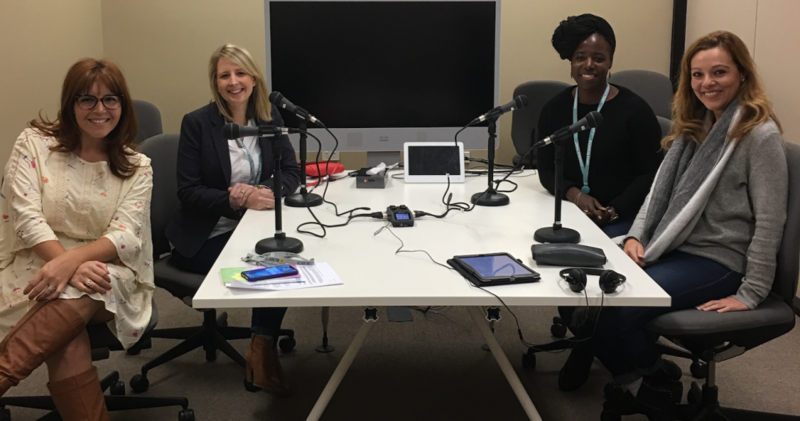 Andrèz from Knowlly and Danielle from Pioneera speaking joined SheStarts Director Nicola Hazell and Carina Parisella from ANZ to record a Bluenotes podcast about the opportunities for startups and corporates to collaborate on innovation. Our founders had a Mentor Mixer which offered the chance to meet with ANZ leaders and pick their brains about finance, global growth and the common threads between corporate & startup environments. During a discussion with some of the Digital Customer Experience team at ANZ, the founders saw that even within a big corporate company the teams adopt the culture of failing fast, on a small scale if possible, to test, learn and develop. The ANZ team explained that if you’re building on the ‘shoulders of giants’ then work tends to be a bit easier, but progress is always more important than perfection. SheStarts founders with ANZ mentors. Women sometimes need a boost in confidence when dealing with financials as many find dealing with money stressful – even when things are going well. ANZ was perfectly situated to help tackle this confidence gap and empower our founders to talk dollars. ANZ commercial bankers provided valuable feedback to our founders by reviewing financials of their startups such as their business model, how their company earns money, how much each customer is worth, cash inflow and outflows as well as considerations for going global. In order to help our founders stay grounded during the busy weeks ahead, we brought in a top mindfulness consultant to share best tips to calm the mind, relax the body and observe our emotions/thoughts. Anne Love from Mindful Moments came on the recommendation of BlueChilli’s Xcelerate Director, Megan Flamer, through Megan’s previous work as a mindfulness consultant in Australia and the US. Anne Love has years of experience practicing and teaching meditation in both the US and Australia in corporate, school and workshop environments. While all the founders had some form of relaxation or calming practices, not one thought of themselves as particularly mindful or ‘good meditators’. It was great to hear Anne explain that there’s no one right way, and that mindfulness or meditation are personal practices. Anne shared that often people have too many expectations of how meditation or mindfulness should be, and that can ruin the positive experience by creating negative emotions. New York is known as the best location in the world for female founders so our founders have been busy honing their investor-focused pitches for this audience. To ensure our they had the best investor-focused feedback, Ariane Barker, CEO of Scale Investors and Chelsea Newell an Investor Manager at Scale Investors, were invited along to provide feedback. Barker offered a unique perspective through her work with Scale Investors where they provide funding for companies that either have a female founder or have female representation at the executive level. Knowing that women make up 80% of the world buying power and therefore see industries with a unique perspective, Barker helped to instill confidence in the founders to recognise their experience, expertise and passion for their startups. All of the feedback the founders received has helped sharpen their pitches, and has helped them to consider global industries and prepare for their SheStarts Investor Night in August at the very end of the SheStarts accelerator program. Over the two intensive Immersion Days, the founders have picked the brains of mentors and SheStarts alumni, reviewed their business plans with financial experts, refreshed their mindfulness habits, and not only endured pitch practice, but thrived sharing their startup stories with investors. Now, it’s time to fly!